ManicForMosaics hand cuts all its mosaic tiles from china dishes. We search garage sales, estate sales, the internet & thrift stores to bring our customers the biggest variety of broken china mosaic tiles offered online. We seem to be able to BUY plates faster than we can CUT them into tiles! If there is something particular you are looking for, ASK US. We might just have it in stock. We cut our tiles with an artist's eye towards preserving the wonderful patterns as much as possible. We do all the work so you can spend your valuable time CREATING! Tiles can have sharp edges so please handle them with care! Man"ic, a. mad, frenzied, of or pertaining to, or characterized by, mania, or excitement. Yep, that pretty much sums up how we feel about mosaics! off white - This refers to the color of the china. This is the color that most people would think of when they think of china. Not quite bright white. white - China that is bright white. ecru - China that is darker than off-white. banner - A mosaic tile that is 1.50" wide or wider. focal - A centerpiece for mosaics that is usually cut from the center of a plate. crazing - The fine crackling appearance that can appear in china, especially older china. footer - The raised edge on the bottom of a plate that the plate sits on. rim - The outermost edge of a plate. 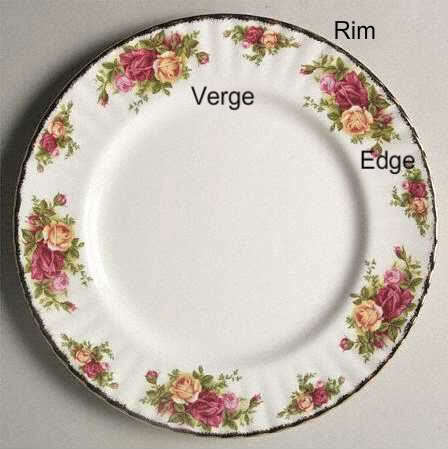 verge - The sloped area on a plate where the eating surface meets the edge.